If you are like most women who struggle with their weight, you would like to wave a magic wand and have the body of your dreams just appear. You may also believe that aging is something that “just happens” to you and that ending up frail and ill is inevitable. Now I know you could probably point to all kinds of “evidence” of somebody you know being a health nut and dropping dead, or people you care about who ended up with an undeserved illness. But most often you are focused on the worst case scenarios rather than the successes. You probably also know a grandmother who still runs races or swims, and women who are careful about what they eat—and think!—and look half their age. What makes you accept that the “worst case” is inevitable for you? “Well,” you might say, “more people seem to get sick as they age.” Or those people who are thriving “just have good genes,” etc. What if there seem like more examples of illness because you are focused on them? What if the majority of people who are sick now saw other people get sick as they aged, and just accepted that as their future? What if the belief that this is your inevitable future leads to choices that will result in that future? What if you have way more control over how well you age than you currently believe? Yes, there is the risk that you could regularly choose healthy foods and move your body every day—and still have issues as you age. But the chances that you will live a vibrant, long, and healthy life increase dramatically. Think about it like money. You may choose to invest your money in what the majority of people tell you is a smart stock option, but there’s still risk that you could end up losing money. But you make the decision to invest for retirement anyway, right? The decisions you make today are investments in your future. 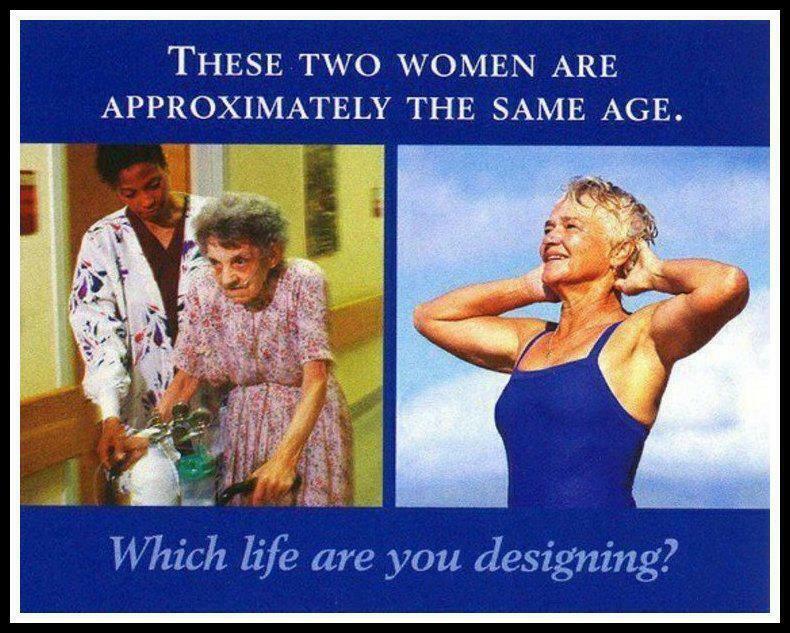 Are you choosing to create a healthy, slim, and strong body—now and as you age—or not? That chocolate cake is not happening to you. You are choosing to eat it. And there is nothing “wrong” with eating it. Making a conscious choice empowers you. It enables you to become the creator or your life. What can you do to begin making the decisions to move towards the body you want today? What impact will those decisions have on your body tomorrow? This entry was posted in Uncategorized and tagged Actions, Beliefs, Body, Choices, Control, Eating, Exercise, feeling, Focus, Future, goals, Happy, Health, Healthy, healthy foods, healthy-living, Inspiration, Life, mental-health, Mind Body Spirit, Positive Thoughts, Weight Loss, wellness by Goss Coaching. Bookmark the permalink. You sure pegged the messages I give myself. It’s what I learned and what I know, but I can change them. It’s taking time and effort but I am worth it. Yes you are!!! Taking the time and effort to change thoughts and beliefs that are not serving you is so worth it! Thanks for commenting! At the gym I will watch some of the older people, or even people my age, who are bent over or using a walker or have oxygen tanks with them, or barely plod around the track, and I think “as long as I can help it/do it/have control over it, I don’t want to be frail like that!” — of course, genes help: my biomom is in her 70’s and still active and strong and years younger than her age. My dad was like that to a point–energetic and dynamic, as well (though he passed away last year due to lung issues — he smoked for many many years and though he quit in his early 40’s, I believe that smoking just damaged his lungs beyond repair). My adoptive mother is very active and strong, and I learned by example from her, too. Being strong gives us our power in so many ways. “Being strong gives us our power in so many ways.” Absolutely! Thanks for commenting! Woo hoo! Love it! Thoughts and attitude are everything! They inspire the choices you are making. Thanks for sharing! Indeed drawing inspiration from our successes can be so transitory. As we choose the chocolate cake, could it be as a reward for the virtuous and regimented life we lead otherwise? Even when we know that the outcome is negative. But to fall is human……. what matters is we rise and strive again. My point was that it needs to be a conscious decision. Of course there is a time and place to eat cake. But make it an empowered choice rather than something you will beat yourself up about later. Agree that what matters is we rise and strive again! Thanks for commenting!